Create a powerful visual experience with the ability to switch between two or four 4K video sources seamlessly. 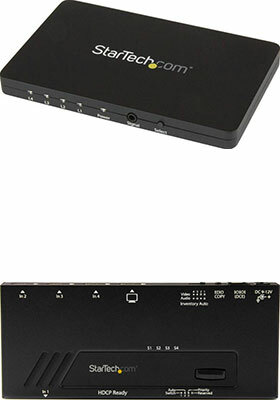 These 2- and 4-port HDMI® switches let you share a monitor, projector or TV with two or four different HDMI enabled video sources, and switch between them with minimal disruption. The video switches maintain 4K Ultra-HD picture quality while switching between content from HDMI source devices - including Blu-ray™ players or DVD players, computer systems, video game consoles, digital cable and satellite boxes and A/V receivers. These switches ensure effortless operation with automatic switching that detects and selects a newly connected device. Automatic switching encourages on-the-fly collaboration among colleagues, by making it easy to share your projector between multiple source devices in a boardroom or classroom environment. These switches also support manual operation using the included IR remote control, or the built-in front panel toggle switch directly on the device.